What’s the Point of Shaving Legs Anyway? Hey beautiful people! I’m so happy to have this totally quirky and somewhat spring-like poem up today at BOAAT PRESS. and the neighbor’s parked truck. you’ll be jittery from the adrenaline. sighing and singing and sleeping. A footprint from the treetops. was what the dinosaurs drank. the elbow, the knee, the transition places. “I believe that listening is the best gift I have to give to this world.” — yours truly. Happy belated Earth Day! I loved answering questions for Carolyn Studer’s blog. There’s a poem, three audio stories (! ), a shout out to Centauri Summer Arts Camp, the People’s Climate March, Cilla McQueen, and spare thoughts on optimism mix, too. 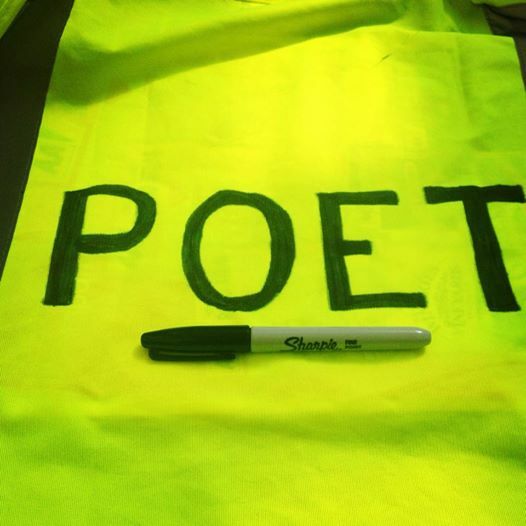 On my 2013 bike trip down the Mississippi River Trail I met a poet at a blues club in Clarksdale who wore a leather jacket with “POET” embroidered on the back in all caps. This is my ‪#‎solofemaletouringcyclist‬ take on that theme. 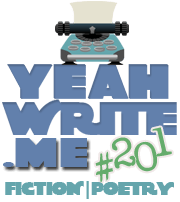 This is my entry into the yeah write #201 fiction|poetry challenge. Who am I? Oh, right. Being a peripatetic poet is fun. on a yoga mat at the Whanganui Women’s Network. Sometimes I feel like an octopus, arms flailing. One tentacle in old poems. One arm following the road. Past, future, present, zooming. It’s dizzying but also a joy. 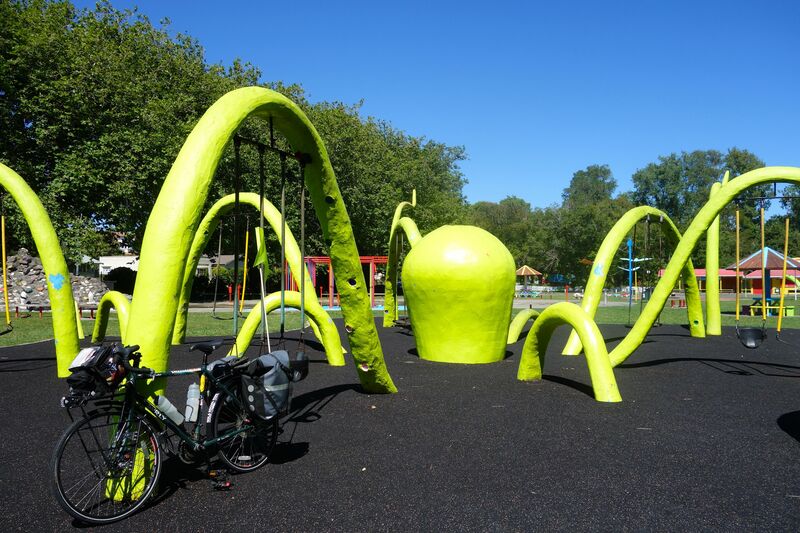 I love funky playgrounds. My bicycle does, too. I spent this afternoon in Fleur Wickes’ studio, green pen all over printed-out versions of 52 pages of poems, many of which formed the spine of my senior thesis in Folklore & Mythology. I haven’t seen the poems printed out since I handed in that thesis, There Are No Straight Lines, back in March 2014. The beast has taken a variety of forms since. Holy guacamole, was that almost a year ago? Anywho, here are two poems from the bunch. A fire drill summons us out of sleep. your hand with my hand down the stairwell. reds and blues. Men in yellow fire-retardant suits. for the body and all its parts, its whole. if not flow of water upside down? a drip a speck a drop in the ozone layer. It’s raining in Suva. I ate a Mary Oliver poem for dinner, along with mushroom stew and rice. On my walk home, I had a conversation with a yellow-beaked bird, bought a Fijian pumpkin (it is green with orangeish spots, awaiting carving later tonight), and let my mind fill with words. roll with rivulets made by road’s edge. to jump and plow through up to the ankle. and huff and puff some of these clouds to California, yes? Like clouds that only seem weightless.